Gucci is one of those fashion brands that famously pushes the limits of what is considered ‘far-shun’. Remember when they debuted those freaky deaky furry horse bit loafers and we were all like ‘whaaaaa’? But then it wasn’t long before we changed our minds and decided ‘actually, they’re kinda cool’ and proceeded to spend the next few weeks/months honing down more affordable alternatives. Granted, you’re never quite sure if your first opinion was wrong, or if you’re just turning into a mild fashion wanker, but anyway, the important thing is that, in that instance, we ended up loving something we initially had a visceral ‘DAFUQ?’ reaction to. Let’s put that down as a ‘win’ for avant-garde style shall we? But now, in stark contrast, is one of Gucci’s newest designs, which can only be described as a total ‘loss’ that nobody will ever ‘come round’ to. “So ya’ll just going to let #Gucci act like they ain’t know better? #Blackface STOP supporting brands that mock you! #BoycottGucci” wrote one. “How does this keep happening with supposedly ‘luxury’ brands? 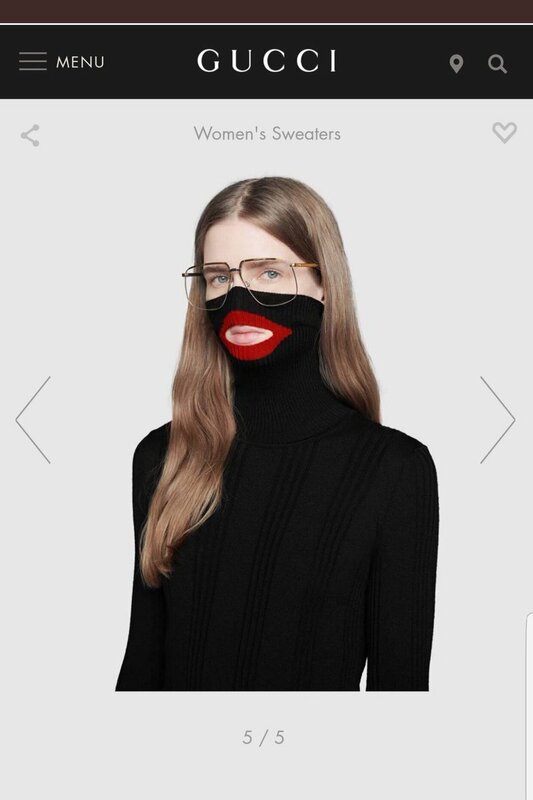 No-one at Gucci clocked the similarity between the racist imagery of their $890 blackface jumper and Prada’s keychain – the latter of which was pulled from stores less than two months ago? Or do they just not care?” added another.